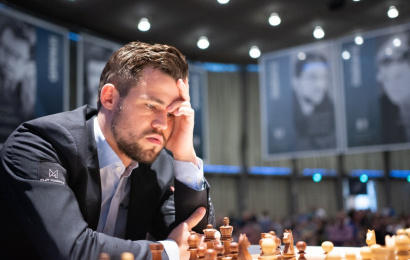 Magnus Carlsen won a 5th game in a row as he beat Paco Vallejo in Round 2 of the GRENKE Chess Classic to retain the sole lead and move over 50 points ahead of Fabiano Caruana on the live rating list. He did it in an ending he said “you get once in your life”, and where you wouldn’t have bet on anyone else picking up the full point. Elsewhere Peter Svidler and Vishy Anand moved into second place with wins over Arkadij Naiditsch and Vincent Keymer, while Caruana-MVL and Meier-Aronian ended in draws.